Tuesday on the nest began with another aquatic avian for breakfish which was a change from all the tasty fishies they had been having. Peace and Harmony were well fed and Harmony scored an orange drumstick that she swallowed whole, webbed foot and all. 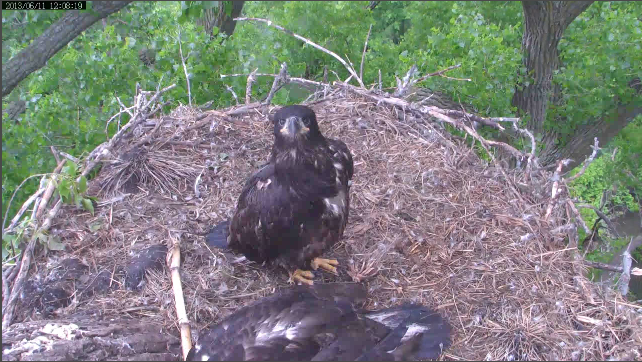 It was a gnatty day on the nest again. 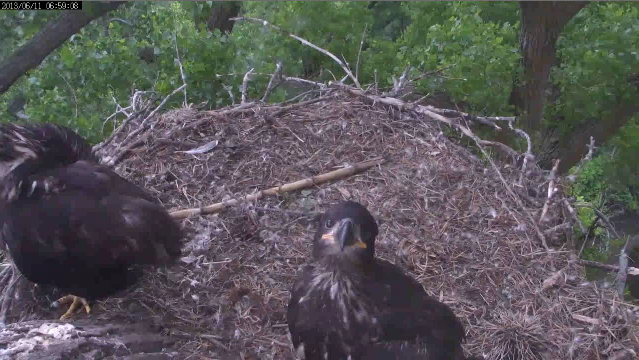 In between swatting and biting at the gnats the morning was spent doing normal eaglet things and plotting the best strategies for attacking a parent when they bring food to the nest. Peace took up her baton practice again and spent a lot of time twirling the cornstalk while Harmony napped and tried to keep out of her way. That kid is going to be a drum majorette when she grows up. About 1pm Dad shows up with what turns out to be a rabbits head and a scrum ensues for possession. Peace wins the scrum but can’t seem to get the rest of the plan in motion. Harmony scores the head from Peace and figures out that its for eating. They play rugby on the nest with it, back and forth, until Mom shows up with something else furry and Peace grabs that too. Mom fed the rabbits head to Harmony and then fed what Peace had to the both of them. About 5pm Dad shows up with a turtle snack and the kids now have a new hockey puck to play with. 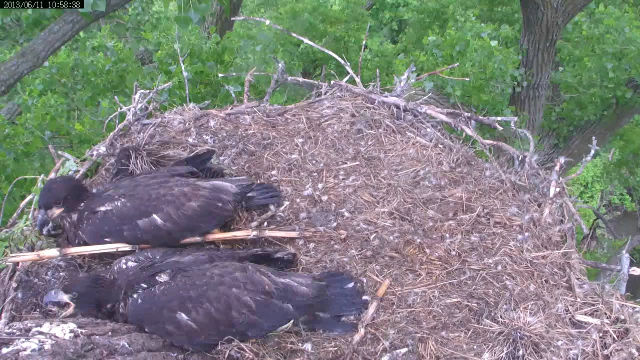 About 7:30pm Mom shows up with half of a big tasty fishy and the kids get a proper dinner. As darkness fell all was serene on the nest even with the gnats still there. On to the vids and pics of the day. Peace executes a perfect mantle and the rugby game is on. A blog exclusive vid! Thanks Razzle! A selection of great pics from the day. That bearclaw really looks good! You gonna eat it all?? Ok, the next one that lands, you hit 'em high and i'll go low! I said, you go high!!! Watch this! A double back beak with 2 and a half twists! Did you give these two half a bearclaw?? HR will be calling you soon. I'm sorry you're in trouble but thanks for the bearclaw! Hey! Can you guys see me over here???? Well, I hope you practiced your twirling for a Tuesday today. The kids are growing up fast and will be branching in the next couple of weeks. We are estimating last week of June for branching with fledging a week or so later after which Harmony and Peace will go to graduate school with Mom and Dad training them to survive on their own. Interesting times ahead for all of us. Have a pleasant evening and we’ll see you on the nest tomorrow!